I first met Samzie Hale around 10 years ago in Tesco’s Cookstown store. I knew she cut my wife’s hair, and I always gave her a smile. One day we happened to be lifting groceries at the same spot on the shelves, and Samzie asked “Are you in the walking club? I would be interested in joining”. I enjoyed advertising the walking club, which was fairly close to my heart, so we chatted about the joining process and the types of walk we did. Samzie duly joined and, to my slight surprise, soon proved to be a strong walker with lots of stamina, keen to learn about plants and animals encountered on walks, and with a good sense of direction. After a few years she completed her Mountain Leadership Course, and was soon fit to lead the club Spring Trip to North Wales. It was then that some of the old hands realised that Samzie was both an excellent leader and a good organiser-she had prepared an enjoyable trip almost single-handed, and led the harder walks on the trip as well. 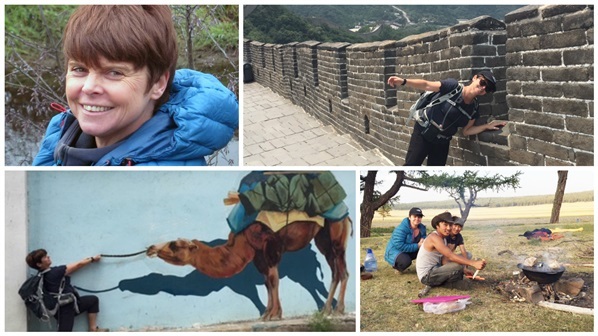 After a few years, she ventured abroad as a leader on a trip to Thailand with a combined Schools Adventure Group. Since then she hasn’t looked back and has been in charge of trips to many countries, gaining confidence and a wealth of leadership experience. One has now only to look up ‘Samzie Hale’ on the internet to discover the extent of her leadership for ‘Ramblers’. This is her walking story…. I was not originally from Mid-Ulster having moved over from London. One day walking past Cookstown Library towards my hairdressing salon I saw a poster advertising a Charity Trek to Nepal. To be honest, I was not quite sure at the time where Nepal even was, but it sounded like an adventure and I was ready for one. I asked my mum if she would come and look after my young son. I sent off the registration cheque and began fundraising. I was keen to start walking as I did not even know the surrounding area where I lived well. I joined our local club, Mid-Ulster Walking Club. That was it, I was off on a journey that would change my life and make me so much happier within myself. I found I loved hiking, especially walking towards a summit or hill-top. With each upward step I felt I was leaving all my cares behind and simply thinking about putting one foot in front of the other in order to get to the top. I even forgot about bills and work! I used to feel sad when the return walk down began. Each downward step seemed to bring me closer to all those day to day worries. When I first began walking, I was running my own small hairdressing business and managing staff. The business entailed long hours and the fact that I was raising my son on my own was an added burden. Walking gave me a huge release and when out with ‘Mid-Ulster Walking Club’ every other Sunday I was introduced to so many new places in Ireland. I am sure I would never have discovered them on my own. The Charity trek to Nepal was the pinnacle of my experience and as a result I was determined to try to make walking more than just a hobby; I wanted to make it my career. I trained as a Mountain Leader which was exciting and interesting, but on the course I felt like Bridget Jones. Everyone else was so much more experienced than I was. A hairdresser who did not even know how to use a compass! I logged the 20 mountain days required before starting the course-mainly gaining experience in the Mournes. With good luck and a map I never had any incidents! After the training, I was on a mission. Every spare minute found me climbing mountains all over the place, I travelled to England, Scotland & Wales and practiced, practiced, practiced. Finally I felt as ready as I would ever be, and after a week of hell in North Wales; they considered me competent and I proudly became a Qualified Mountain Leader in 2006. I think it was the hardest thing I ever had to do, to me it was just like getting a Degree. The rest is history; I now work as a Freelance Expedition Leader and have been all over the world taking both adults and students on life-changing challenges of their own. I wish I had been introduced to walking and the outdoors when I was at school (in those days there was no Duke of Edinburgh at my inner London comprehensive). It is fantastic to be able to enjoy a great activity that is both free and non-competitive. It doesn't matter if someone walks faster or longer than you, it is all about enjoying the walk! Sometimes, when I think back to the time before seeing that library poster, I am not sure how I would have got through some really anxious times if walking had not become my outlet. 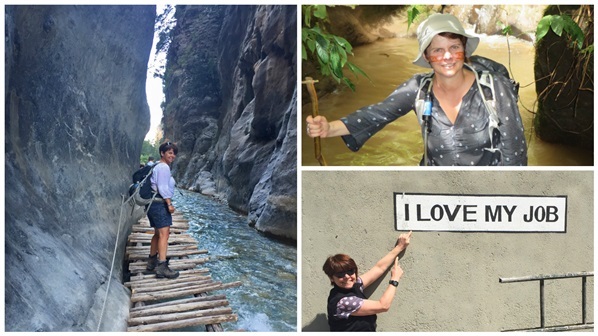 I now work freelance for ‘World Challenge’, taking schoolchildren from the UK, Australia & Middle East all over the world and I also lead ‘Ramblers Worldwide’ walking trips for adults mostly in Crete & South East Asia. The job has given me opportunities to visit many beautiful countries, but my most enduring memories are of the kindness and friendliness of the people I have met on these trips. It is both staggering and humbling to receive such generosity from people who themselves often have little. The combination of travel and adventure and opportunities to lead groups in jungle, deserts and high mountains has enabled me to share close-up time with a wide range of people from many countries, and appreciate how lucky I am. I found out that it is never too late to change your life and to follow your dreams-no matter how big or small those dreams may be. Walking has helped me make many new friends as well as cope with pressures. Every wanted to try a new activity but didn’t know where to start? Tollymore National Outdoor Centre has created a series of ‘First Step’ skills courses perfect for complete beginners. 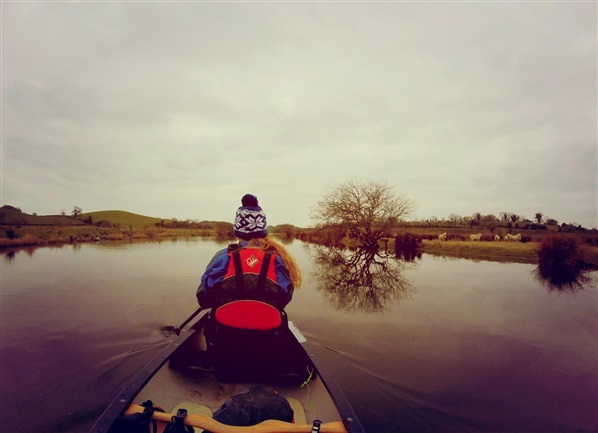 From canoeing to climbing and mountain biking to hill walking navigation these skill focused courses are all about trying new things and gaining confidence in the great outdoors so when the opportunity came up to attend the First Step open Canoeing Skills course I was raring to go! The course started with a coffee (as all good courses should!) where we had a chance to chat whilst everyone arrived. We were then introduced to Emma and Amy our instructors for the session who took us through the plans for the day. After a few intros to find out everyone’s skill level/experience we headed down to the store room to get kitted out for our day of canoeing. I’d been in a kayak a couple of times but never a canoe so my experience was definitely limited (illustrated by my first question on seeing the boat; ‘How do you know which way is the front? !’) This was by no means an issue however as all the courses are designed that experience is not essential. Everyone was there for different reasons; some were already members of clubs but wanted to gain the confidence to take their families out on their own, others wanted to improve their skills to paddle with their more competent partners (and hopefully avoid a few domestics on the water!) and the rest, including me, were there to simply get out and have fun in the outdoors. Tollymore National Outdoor Centre has to have one of the most extensive kit stores around, so there was no need to worry about having to own any expensive gear. The store had everything from wetsuits, helmets, buoyancy aids and cagoules to dry bags and neoprene boots (which was great if someone, say hypothetically, forgot to even bring a rain coat!). A few people brought their own kit to try out which was also an option and a good way of putting new gear to the test in supervised conditions. After a quick change we headed to the storage units to get our canoes and loaded up the trailer. The crafts were surprisingly light and with good team work and some expert knot tying skills it wasn’t long before we were ready to go. A 20 minute drive to our starting point at Annacloy (during which I may or may not have prematurely tucked into my lunch supplied by the centre– the temptation of the homemade flapjack was too much!) we were dropped off with the gear before the bus was shuttled to our end point in Downpatrick. Getting ready to launch the canoes; team work makes the dream work! 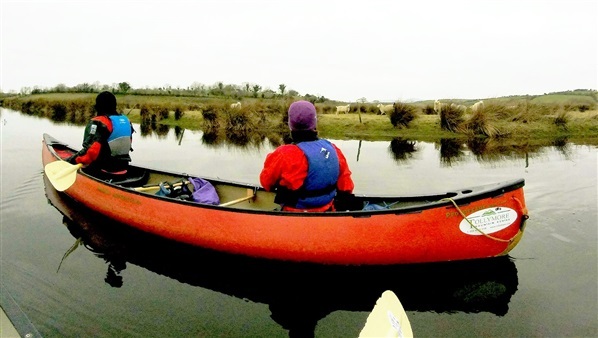 We partnered up, two to a canoe and before we knew it were on the water ready to go - they say the best way to learn is by doing and that was definitely the case with this course. Emma was on hand in her own canoe to expertly paddle between everyone keeping an eye and instructing. The river was pretty fast flowing at the start but everyone managed excellently. Learning how to confidently stop in Eddys (my first canoeing term for the day which refers to calmer spots on the side of the river) was first on the agenda. This allowed us to wait on each other and keep everyone in sight as we paddled the meandering river downstream. It wasn’t long before everyone was comfortable with each other communicating between the back and front of the boat. Although the Spring time lambs were bouncing about in the fields beside us it was a cloudy, chilly day however our wetsuits and layers which we had been advised to bring kept us warm - the arm workout was also a good insulator! Once everyone’s confidence was up we were shown one of the most important canoe skills, the J stroke, which helps correct the direction of the canoe whilst paddling forward. As we attempted to get to grips with it, Emma paddled between us checking our technique and making sure we were on the right track. It wasn’t long before we were stopping off on dry land to stretch our legs. Realising it was already lunch time the sandwiches were opened and devoured – a picnic never tasted so good! After getting a few more tips on our strokes on dry land it was time to hit the water and swap places in the canoe so everyone got the chance to experience steering at the back. After lunch a group of swans led the way as we continued along the river, blue skies finally breaking through the cloud. The journey was very peaceful as we paddled beside countryside with even a rogue seal popping up to say hello. The chat was flowing as we took in the stunning views across to Down Cathedral before pulling up ashore to stretch our legs in the idyllic setting of Inch Abbey ruins. After some exploring we got back in the canoes and headed towards the tunnels below Downpatrick Rd Bridge (a much talked about subject during the day) it was clear everyone had gained a lot of confidence throughout the session as we paddled on through the interesting canoe sized holes without worry. On the other side it was a short paddle to the mini bus waiting for us at Jane’s Shore in Downpatrick where we loaded up and headed back to the centre for a change and a coffee. I had a fantastic day out with a great bunch of people and felt our instructor created a very positive and chilled out learning environment with an emphasis on encouragement rather than competitiveness. If you are looking to improve your skills, learn something new or want to do something completely different whilst having a laugh then this is the course for you!